Having fun with bowling - strike! The Activity Resource Centre makes my day! Warm and caring staff make the difference! Participation House, Markham has a long history of making life better for people with disabilities and, every day, we build on that history. 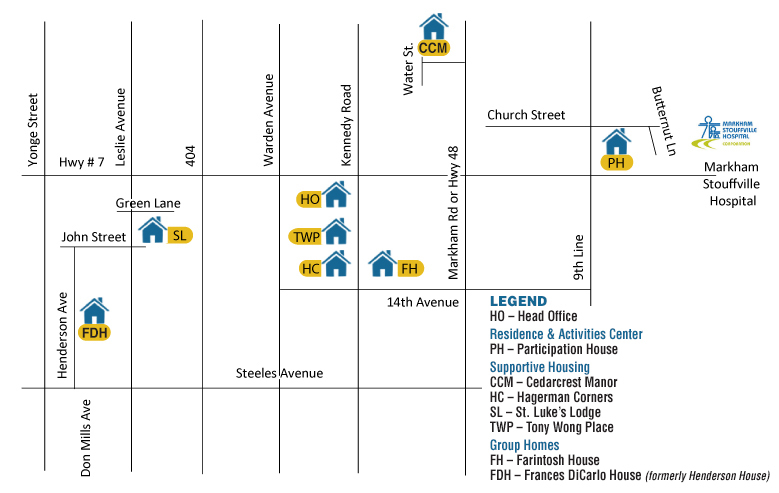 At seven different sites in York Region, we serve 114 men and women ranging in age from 20 to 86. Every one of our clients deserves the very best of life, and we help them live it. Participation House, Markham receives financial support from the Ontario Government, namely the Ministry of Community and Social Services and the Central Local Health Integrated Network (Central LHIN). This support covers substantially all of our operating costs, however vital capital investments, such as specially-equipped vans, pool improvements, running our Gym Program and Adult Literacy School, as well as other capital projects, are funded through our own fundraising activities. Changing government funding policies in the past few years have had an impact on social agencies such as Participation House, Markham. These changes have mobilized PH to become an active and innovative fundraiser. Your support is critical in maintaining a high quality of life for our residents and clients. Your support will assist the Physical Exercise Program that promotes independence and active living for our residents. Help us reach this year’s goal of $40,000 to continue expanding and advancing our gym and pool programs. Last year we raised $38,000, enabling this valued program to continue. This year we aim to grow the Physical Exercise Program by offering one-on-one individual exercise, a daily group exercise activity and purchasing new equipment to enhance the lives of our residents. Without you, this day would not be successful ! Thank you.